The James Kaneko Gallery at American River College has installed a refurbished cigarette machine that now dispenses art to raise money for gallery costs. The machine, dubbed the Art-O-Matic, originally sat in the art department’s administrative office but opened to the public this semester as a part of the gallery. 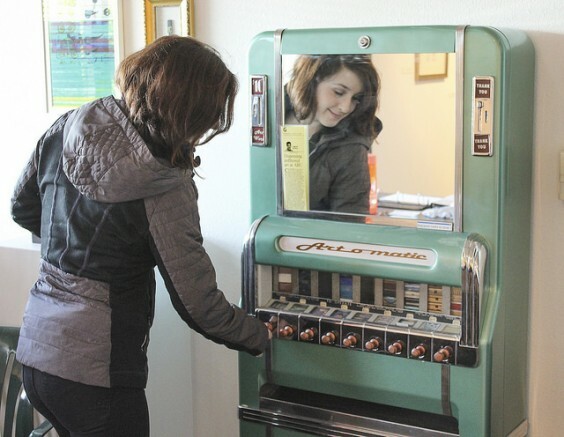 The Art-O-Matic dispenses art from seven different artists, along with art by ARC students. The machine takes tokens, which are sold at the gallery for ten dollars each. All profits generated by the machine go back to the gallery to help cover costs to book artists and run shows. “It helps us get artists from further places. It helps us achieve greater things,” said art student Trisha Carter. The machine may even help the gallery start a lecture series, bringing in artists and art curators, according to Wood. The machine has a storied past, and ARC art students even have a theory that connects the machine to Elvis. Wood and her students highly encouraged ARC students and staff to see the Art-O-Matic and the current exhibition in the gallery, “Selections from the Museum of Historical Makeovers” by Kathy Aoki. The Kaneko Gallery is open Monday to Thursday from 11 a.m. to 4 p.m. and Fridays from 11 a.m. to 2 p.m..
Be the first to comment on "Art-O-matic raises money for James Kaneko Gallery"